[172 Pages Report] The shale gas boom coupled with growing demand of energy with increasing drilling activities in offshore and unconventional exploration and production activities is expected to drive the North America completion equipment and services market. It is estimated to reach $5.27 billion by 2019, at CAGR of 2.5% from 2014 to 2019. Latest and highly advanced technology is required in the U.S. Gulf of Mexico and Canada. High growth in deepwater and ultra deepwater explorations in these regions is expected to push the demand for completion equipment and services market in North America. Completion equipment and services are well completion technologies used for packing, sand controlling, many such other purposes. Completion services include performing casing, cementing, perforating, gravel packing, and installing a production tree for the well to start production. It is also important to identify whether the hole should be plugged and abandoned as a dry hole. These completion activities require different kinds of equipment for performing the above mentioned services. With technological developments impacting this market, various new technologies such as sensors for measuring flow properties that includes rate, pressure and gas-to-oil ratio known as smart wells has been on the rise. Completion equipment and services are provided by oilfield service companies such as Halliburton (U.S.), Schlumberger (U.S.), and Baker Hughes (U.S.) and oil & gas companies such as Shell (The Netherlands). The completion equipment and services market is the largest in North America as compared to the global completion equipment and services market. Leading oil field service companies–Schlumberger (U.S.), Halliburton (U.S.), Baker Hughes (U.S.) and other medium and small players–operate in North America. For this report, the major players in North American market have been identified through secondary and primary research, based on which their market shares have been evaluated. This includes a study of the annual reports of top market players and interviews with key opinion leaders such as CEOs, Directors, and marketing people. The size of the overall market is determined by forecast techniques based on the completion equipment and services demand in North America, which has been validated through primary sources. The market revenue for various types of North America completion equipment and services has been determined and evaluated using primary and secondary research. The data for this market is provided from 2012 to 2019, with CAGR calculated from 2014 to 2019. This report analyzes various marketing trends and establishes the most effective growth strategy. It identifies market dynamics such as drivers, opportunities, burning issues, and winning imperatives. Major companies such as Schlumberger (U.S.), Halliburton (U.S.), Baker Hughes (U.S.), and Weatherford (Switzerland) have also been profiled in this report. North America Completion Equipment & Services market: Expected to reach $5.27 billion market by 2019, signifying a firm annualized growth rate of 2.5% from 2014 to 2019. Completion equipment and services are used for a wide range of purposes after the drilling of well is carried out. Completion equipment and services are precisely used for converting a drilled well into a producing one. Completion includes various stages before the well starts production; these include casing, cementing, perforating, gravel packing, and installation of a production tree. In this report, the market has been analyzed on the basis of revenue generated by the completion equipment and services supplied by oilfield service companies to the oilfield services market in North America. 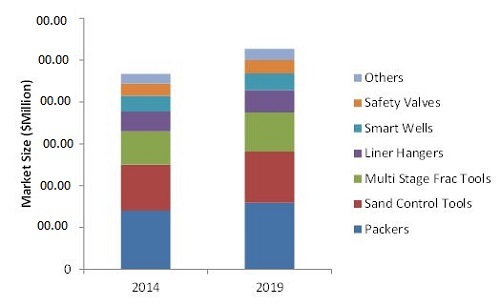 Major value generation activities of the market are recorded in North America and the other regions are growing at a higher growth rate with the exploration of new reserves, creating growth prospects for the completion equipment and services market. The North American market is reaching towards maturity and the movement in the market would mainly be subjected to competition. 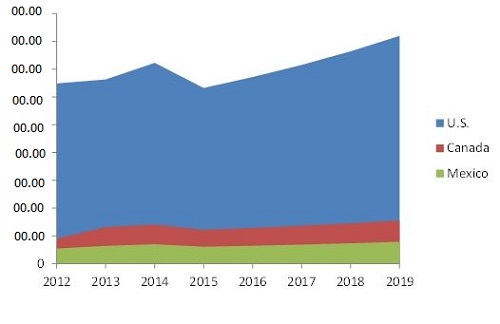 Rise in deepwater and ultra deepwater discoveries, with high growth in exploration and production, activities are the most important drivers for the completion equipment and services market in North America. Equipment and services are used for the completion of well for oil and natural gas, while these services are necessary for any type of well to complete it and put it on production. Currently, natural gas is referred to as transitional fuel between conventional resources and renewable energy. This proves to be an advantage to the international natural gas market, and hence to the completion equipment and services market in North America. As the energy demand in developing countries such as India and Brazil is increasing, fulfilling this demand would push growth prospects for completion equipment and services market. Drilling activities in countries such as Canada and Mexico are expected to propel growth in the North America completion equipment market. The growth of completion equipment and services market depends on many reasons including environmental ones, which is an important hurdle for the growth of this market. The North American region has both natural resources as well as technology, to make production of hydrocarbons viable. Moreover, the presence of major players in the market also makes implementation of technology at the production site economical. North America dominates the completion equipment and services market. This dominance is seen mainly due to continuous and large increment in the U.S. exploration and production activities. North America has the highest market share of over 50% in the global completion equipment and services market during the forecast period, because of favorable regulations in the region. The U.S. region is expected to dominate the North America completion equipment and services market in the next five years. 2.2.1.1 Increasing Number of Horizontal Wells in the U.S.
5.3.1.1 Increase in the Number of Horizontal Wells in the U.S.
12.6 Packers Plus Energy Services Inc.
12.9 Trican Well Service Ltd.
12.11 Superior Energy Services Inc.
12.14 Nine Energy Services Inc.